A storm surge is water that is pushed onto shore by a hurricane. It is rarely a "wall of water" as often claimed, but rather a rise of water that can be as rapid as several feet in just a few minutes. The storm surge moves with the forward speed of the hurricane — typically 10-15 mph. This wind-driven water has tremendous power. One cubic yard of sea water weighs 1,728 pounds — almost a ton. This means a one-foot deep storm surge can sweep your car off the road, and even a 6-inch surge is difficult to stand in. Compounding the destructive power of the rushing water is the large amount of floating debris that typically accompanies the surge. Trees, pieces of buildings and other debris float on top of the storm surge and act as battering rams that can cave in any buildings unfortunate enough to stand in the way. If you receive an evacuation order for a hurricane storm surge, it is a good idea to get out sooner rather than later. The storm surge can begin to rise a day before the storm hits, cutting off escape routes when low-lying highways are flooded. This is particularly true along the Gulf of Mexico shore. If you live near the ocean, the storm surge is the most dangerous part of a hurricane's hazards. The high death tolls of the ten deadliest U.S. hurricane disasters, including the Galveston Hurricane of 1900 (over 8,000 killed), the Lake Okeechobee Hurricane of 1928 (2,500 killed), and Hurricane Katrina of 2005 (1,833 killed), were primarily due to the storm surge. Hurricane Katrina's storm surge pours over the 8-foot high north levee of the MRGO/Intra-Coastal Canal, directly under the Paris Road Bridge in eastern New Orleans. The photo was taken by Dan McClosky, the manager of Entergy's Michoud Power Plant. Mike Collins of Austin, Texas put together a nice in-depth description of this photo, which was judged as being authentic on the hoax debunking web site snopes.com. The storm surge depends greatly upon the size and intensity of a hurricane, the angle that it approaches the shore at, how deep the water is close to shore (the slope of the seabed at the coastline) and how fast the hurricane is moving. 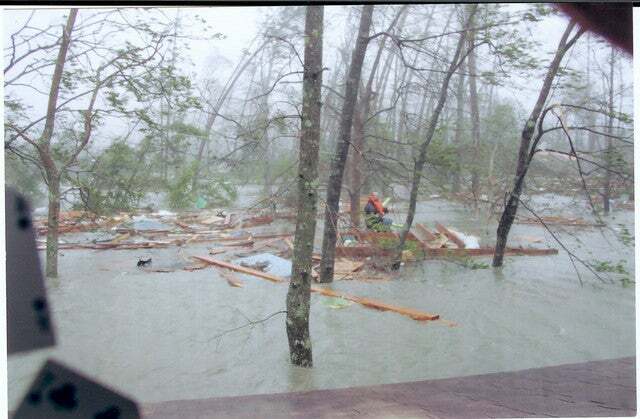 Learn more about storm surges with Jeff Masters' articles: A detailed view of the storm surge: comparing Katrina to Camille and General characteristics of storm surges. Depiction of a 15-foot hurricane storm surge occurring at high tide of two feet about mean sea level, creating a seventeen foot storm tide. Note that there are 10-foot waves on top of the 17-foot storm tide, so the external high water mark (HWM) left on the outside of structures by this hurricane could be 27 feet or higher. Image credit: NOAA SLOSH Display Training Manual (PDF File). The storm surge is how high above current sea level the ocean water gets. The number we are most interested in regarding storm surge is how many feet above mean sea level (MSL) inundation will occur. This number is known as the storm tide, not the storm surge. The storm tide is the height of the storm surge above the MSL, corrected for the tide. For example, in a location where high tide is two feet higher than mean sea level, and low tide is two feet lower than mean sea level, a 15-foot storm surge would cause a 17-foot storm tide if the hurricane hit at high tide or a 13-foot storm tide at low tide. Keep in mind that on top of the storm surge will be large waves capable of causing severe flooding and battering damage — these waves are not included in storm surge forecasts. The waves on top of the storm tide break when they reach shallow water and create an external high water mark (HWM) on structures. The high water mark can be much higher than the storm surge or storm tide. For example, the maximum storm surge of Hurricane Katrina was 27.8 feet in Pass Christian, Mississippi (measured inside a building where waves couldn't reach). However, the highest high water mark was much higher — 34.1 feet on the outside of a building in Biloxi, Mississippi, where a high tide of about 1 foot combined with 11-foot high waves on top of the 22-foot storm surge to create the 34.1-foot high water mark. High water marks on East Ship Island, Mississippi, after Hurricane Katrina in 2005. 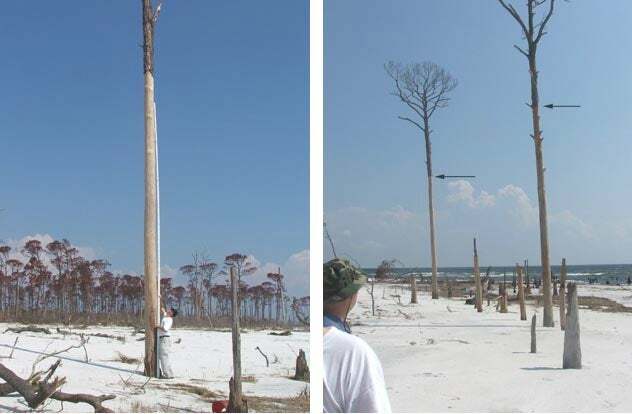 Left: Bark stripped off a tree with salt-burned pine trees in the background (note the 25 ft [7.65 m] long survey rod for scale). Right: Massive beach and over wash erosion illustrated by damaged and snapped pine trees along the beach. Arrows show the the high water mark left by the storm surge. Image credit: Fritz et al., 2007, "Hurricane Katrina storm surge distribution and field observations on the Mississippi Barrier Islands." The storm surge is usually the most dangerous threat of a hurricane. Those lucky enough to survive Hurricane Katrina's record storm surge shared their stories, shedding light on some common misconceptions about storm surge survival. How? No one will be able to get to you. Water rises quickly — sometimes 6-10 feet within minutes; cars can't drive in it and it is usually unnavigable by boats when it is coming ashore. Bad idea. In a minute or so the surge will burst open the door, and instead of standing in a room with four inches of water, you'll be knocked off your feet and into whatever piece of furniture is closest. You'll suddenly be in three or four feet of moving water that you can't make any headway into. Probably not. Some people who drowned were not even able to get out of the room they were in when the water started pouring into the home. The speed of water in a surge can be equivalent to Class III or IV rapids (Class V is hardly navigable even by expert kayakers). The surge is usually not a wall of water as is often assumed but rather a rapid rise of water of several feet over a period of minutes, meaning it can sneak in unexpectedly. I hate to bother you again, but we live on Marathon in the Florida Keys on the Atlantic side, and my husband says that if we see water coming up from storm surge and have an inch of water in our house, that we can outrun the storm surge in our car. Can you please tell me if there is any way this can possibly be true? P.S., I don't know of anyone who lives down here who is planning on evacuating for Ike. Everyone says they are staying. If you wait until the water is an inch high before trying to outrun the surge, the odds are that the surge will rise to over a foot high before you get your car out of the driveway. If the water is a foot high, the typical 10-15 mph speed of the storm surge's current has enough force to sweep a car away. In many places along the coast such as the Keys, there is only one road out of a low-lying region prone to storm surges. In such cases, the storm surge will likely be moving perpendicular to the road, cutting off the only escape route. A man wearing a tiny life jacket and clutching a neon green noodle and a pet dog floats on the remains of a house in Waveland, Mississippi, during Hurricane Katrina. The photo was taken from the second floor window of a home, and the water is close to the roof line of the first floor. The home was at an elevation of about 17 feet and the surge is close to 10 feet deep here. There are electric lines running down from a pole to a home from left to right. In the distance on the right is a home with water up to the roof line. The photo was taken by Judith Bradford. Her husband, Bill Bradford, swam out and rescued the man and his dog, and two other people who floated by. 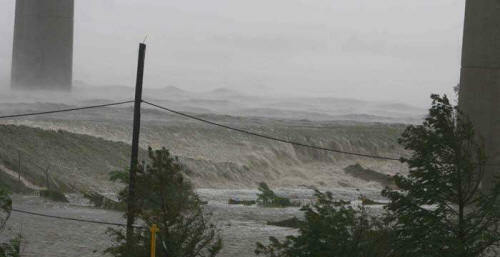 The image above is described in more detail on Margie Kieper's Katrina storm surge web page. It is common in many flood-prone regions behind levees to keep an axe fastened to the wall of the attic. Then, if water comes in unexpectedly, you can get into the attic and chop a hole through the roof to escape. Don't forget to keep a length of rope there that you can use to tie yourself to a sturdy part of the house (just don't tie yourself to the steel beams of the house as these will sink). Prepare a separate pet plan as most public shelters do not accept pets. If you live near the coast, or are thinking of buying property near the coast, it's very much in your financial and survival interests to know exactly what elevation your home is at. If you are a home owner, your flood insurance certificate should tell you what your elevation is, based on the best available USGS surveys for the area. In some cases, though, this information is not very precise. For example, in the New York City area, elevations as of 2008 on USGS topographic maps were only surveyed to an accuracy of 10 feet. Along the Hudson River and some portions of Long Island, the accuracy was only 20 feet. These topographic maps have a considerable error range, too, with 90% of the data rated as accurate to plus or minus half the contour interval. This means that 90% of the points along a 10-foot contour line lie in the 5-15 foot range. This is a pretty broad range if you're trying to judge your vulnerability to a storm surge. Efforts are being made in many areas to perform high-resolution mapping using laser measurements from aircraft combined with GPS. These data sets generally have an accuracy of 0.15 meters (6 inches), but the data is limited in coverage and difficult to find on the Internet. Probably the best solution is to use existing low-resultion data (3-30 meters in the U.S.) and interpolate the data to your location. Keep in mind that the errors will often be large using these techniques. Below are some ways you can determine your home's elevation. The current best available elevation source data for the USGS National Elevation Dataset over the mid-Atlantic region. Lidar data typically has an accuracy of 0.15 meters. 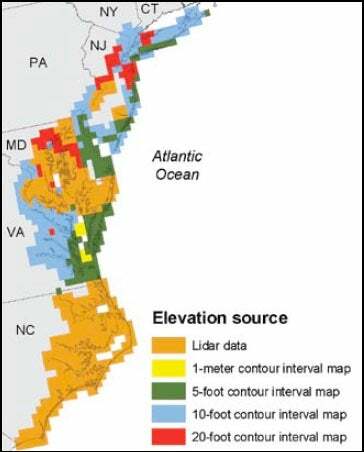 Image credit: Coastal Sensitivity to Sea-Level Rise: A Focus on the Mid-Atlantic Region report by the U.S. Climate Science Program. Hire a surveyor to get an elevation accurate to an inch. Cost: $200-$500. High-accuracy lidar data is available at the NOAA Coastal Services Center. The sea level rise viewer allows you to visualize community-level impacts from coastal flooding and sea level rise. United States Geological Survey (USGS) National Elevation Dataset. Accuracy: 3-30 meters. A zoomable interactive map lets you click on your location and see the interpolated elevation. Don't be fooled though, when you click and see an elevation of 5.28 feet in a region where the resolution of the data is only 10 meters (1/3 arc second, 33 feet). The real elevation could easily be 1 foot or 30 feet. EPA sea level rise pages for the U.S. Atlantic coast. Shows the modeled areas of elevations below 1.5 meters and 1.5-2.5 meters. No roads are overlaid, so it's a bit hard to tell what cities are impacted. Google Earth: The best elevation accuracy of Google Earth in the U.S. is 10 meters. GPS: Global Positioning System (GPS) is not a good choice since the vertical accuracy of most hand-held GPS units for home use is only 15 meters (49 feet). If you have access to a commercial grade differential GPS system (a minimum of $5,000), one can get an accuracy of a few centimeters.